After reviewing some of the best ukuleles in the consumer and enthusiast markets, we’ve found that the Oscar Schmidt OU5 Concert Ukulele by Washburn consistently meets the needs of the average ukulele player. 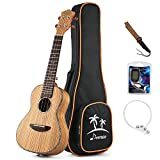 We analyzed hundreds of Amazon reviews in order to choose these ukuleles for your consideration, plus we’ve assembled some tips for choosing the best ukulele. Oscar Schmidt OU5 Concert Ukulele. 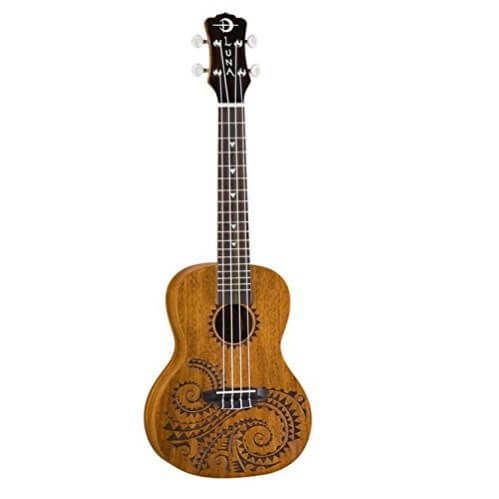 Our Top choice is the Oscar Schmidt OU5 Concert Ukulele. It’s a great choice for players on all levels. A ukulele provides a sweet, melodious sound, but without the right one, you may sound as if you’re hitting the wrong notes. High-quality ukuleles let you enjoy your choice of softer, mellower tones or bright, cheerful notes, all with good sustain at the right pitches. If you’re new to the ukulele, then considering different brands will help you choose an instrument that appeals to you, particularly with input from experienced players. There are a surprising number of considerations to keep in mind when choosing the best ukulele to play. Do you like a warmer, mellower sound, or a brighter, more cheerful sound? Do you prefer a higher or lower pitch? Each ukulele will provide its own unique sound depending on the type and brand, so consider your preferences as you determine which one is ideal for you. We’ve come up with a list of the five best ukuleles on the market. All of these instruments provide quality sounds, which you and your listeners will enjoy. marks for its beautiful Hawaiian Koa body and top. Its deep, glossy finish looks and feels amazing. Abalone shell rosette and binding impart tropical beauty, while the rosewood fingerboard and bridge provide contrast. Grover chrome tuners help keep the sound true while you enjoy playing your favorite songs on stage or around the campfire. 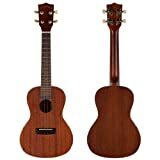 The 15-inch scale length combines with the slightly larger body size, providing plenty of sweetness and a bright, classic ukulele sound. 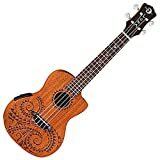 This is without a doubt one of best concert ukulele under $200 on the market today. Like many other ukuleles, this one is equipped with nylon strings, and these do need time to stretch before the instrument stays in tune consistently. The chrome tuners have closed backs, and they offer a nice, solid feel. Case not included (so you’ll have to pitch in extra if you need one). Somewhat incosistent (sometimes it goes out of tune). The instrument is beautiful and well-made. This ukulele has a bright, rich tone. The fret board is nicely finished, with no sharp edges. If you’re looking to take your playing to the next level, the Oscar Schmidt OU5 is a good choice. It takes a little time for the strings to stretch, for example it took about a week for the “E” string to settle, but everything is great now. Affordable for the value that you get from the ukulele. Fender makes high-quality instruments, so we weren’t at all surprised with this beautiful tenor ukulele, in the popular “Nohea” finish. Made of laminated koa wood, it features an aged abalone acrylic binding and rosette, plus a beautiful gloss finish. Fender enthusiasts will appreciate the classic Telecaster guitar headstock shape making it the best concert ukulele under $500. The frets are finished and well-set, and the tuners are fantastic. Once the nylon strings have been broken in, the Fender Nohea ukulele holds its tune, barely requiring readjustment. This ukulele does have a pickup, so you can play it into a DAW or over an amp. Great acoustics and consistency; it rarely goes out of tune. Good for professionals whether practicing or gigging. Longer neck than “standard” ukuleles, so it may dissuade amateurs. Fret buzz may become an issue if played too hard. This ukulele is beautiful and well-made. The white Aquila with nylagut “C” strings provided offer a bright, appealing tone. Swap to black nylon strings if you want a warmer, mellower tone. Relatively inexpensive, but offers a good, reliable performance. Fun, easy to play ukulele that holds tune well once the strings have had a chance to set. The tenor size is comfortable to play, compared to a smaller soprano or concert ukulele. A distinctive finish makes the Luna Mahogany Series Tattoo Concert ukulele stand out. Designed with inspiration from traditional Hawaiian body ornamentation, it incorporates symbols that represent the honu, or Hawaiian turtle. The “heart song” rosette and stylized sharks teeth fret markers add even more distinction to this lovely instrument. Thanks to a solid spruce top, plus mahogany sides, back, and neck, this ukulele offers a rich, pure sound that easily fills a room more than a standard Soprano ukulele. Affordable price/ gig bag included. Unique decoration may be unattractive to some players. Has no knobs to attach a strap. The engraved tattoo detail makes it look higher end. The tuning heads are fine once the strings stretch and settle. It’s a great sounding instrument, especially considering the affordable price. Made of beautifully grained zebrawood, this concert ukulele offers a distinctive appearance and a wonderful sound. The back board features a patent pressure convex design, which provides the instrument with more volume, outstanding resonance, and a richer tone. The rosewood bridge and mahogany neck provide just the right amount of contrast, and a glossy finish shows off the wood’s grain. Once the strings have a chance to settle in, the instrument holds its tune well. The 23” concert size makes it easy to play more complicated chords. Good value for money/ gig bag included. Elvis engraved tuners are a really nice touch. This is an outstanding instrument for the price. The intonation is spot on. Beautiful abalone inlays and a smooth finish make quality finishing touches. This ukulele is comfortable to play. Sturdy build with quality craftsmanship. Many comparable competition products around this price range. Excellent quality, very surprised by the low price. Initially, the strings needed frequent tuning. Once broken in, they are perfect. Easy to play and easy to tune. Not just for beginners, a nice instrument for ukulele veterans as well. Quality of Wood: Hawaiian Koa, Sitka Spruce, and Mahogany are among the most popular woods, and all are high-quality. The wood used to build the ukulele has an impact on the way it sounds, as well as the way it performs over its lifetime. Choosing a low-quality wood means you’ll pay less, but it can also mean problems with pitch, tone, and the instrument’s physical integrity. Size of the Ukulele: Ukuleles are typically available in four sizes. Soprano, or “standard” ukuleles are smallest. If you have very large hands, you might find it difficult to play this instrument, especially when you get into more complicated chords. The medium, or “Concert” ukulele is a bit larger, and offers its own sound and feel. 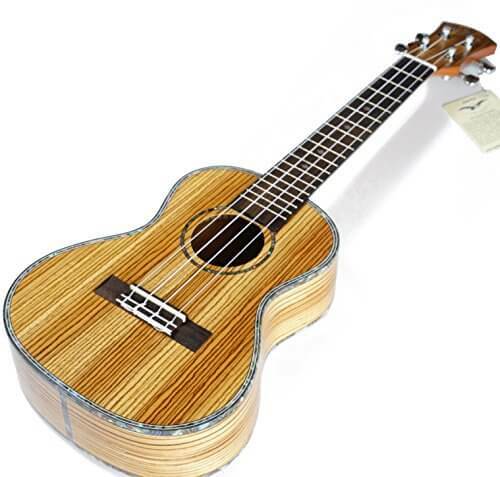 Tenor, the next size up, is favored by professionals, and baritone, the largest ukulele, has the deepest, richest tones. Sound: It’s crucial that you like the way your ukulele sounds. There are amazing variations in sound, and it is often said that ukuleles are such individuals that no two are exactly alike. Price: An ultra-cheap ukulele might be fun for the beach, but it’s likely to sound tinny. Many players appreciate mid-range ukuleles and find that adjusting the bridge, nut, and frets ensure good tone and sustain. Experienced players and professionals tend to prefer high-end ukuleles, which tend to start around $350.